1. 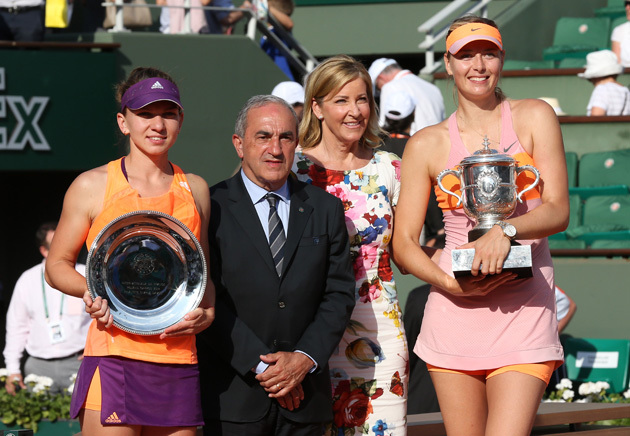 Maria Sharapova d. Simona Halep 6-4, 6-7 (5), 6-4, French Open final. Tennis Channel re-aired this match last weekend and on a second full viewing it remains one of the best Slam finals played in the last decade. The only one that rivals it for pure quality is Venus Williams' 4-6, 7-6 (4), 9-7 win over Lindsay Davenport in the 2005 Wimbledon final. On a warm, muggy day in Paris, Sharapova overcame 12 double-faults -- and Halep's grinding, relentless defense -- to capture her second Roland Garros trophy in three years. “This was the toughest Grand Slam final I've ever played," the Russian said after the match, which lasted over three hours in front of an electric crowd on Court Philippe Chatrier. The momentum swings were dramatic. Halep, the higher seed, got an early break at the start of the match before Sharapova reeled her back in with punishing groundstrokes to take five straight games and pocket the first set. The second set saw Halep serve for the set at 5-4 only to get broken. After she forced the tiebreak, Sharapova looked on her way to a tough straight set win, getting to 5-3, just two points from victory. But the match was level in a blink, as Halep reeled off four straight points to level the match at a set apiece. In the final set it was Sharapova who elevated her game just one notch higher. In a key fourth game she squandered a 40-15 lead and had to save break points to hold to 2-2. Disappointed by her inability to break, Halep played a sloppy next game and gave Sharapova the easy break. With the break in hand, Sharapova steeled her focus and held out the set to win the match. This match wasn't great simply because of the drama. It will go down as one of the classic WTA matches of the decade simply because of the quality these two women produced under incredible pressure. 2. Petra Kvitova d. Venus Williams 5-7, 7-6 (2), 7-5, Wimbledon third round. How different would Wimbledon have been had Venus won this match? Given all the upsets in the tournament and how open the draw became in the later stages, is it impossible to think she might have been able to win yet another Wimbledon title? If you watched her valiant performance against the eventual champion, you walked away believing she could have. "It's a shame there had to be a loser in this match and more of a shame that it had to be me," Venus said afterwards. This was women's grass court tennis at its very best. If you hate long protracted rallies and love first-strike tennis -- as it's supposed to be on grass -- this match was for you. It was decided by razor-thin margins and it's the match that propelled Kvitova through the rest of the tournament, where she would finish with her second Wimbledon title in four years. We knew we were in for a doozy when the draw came out and placed these two champions into a third round clash. It was an incredibly unfair situation for both women, who were playing well enough to make the later stages of the tournament. In the four prior meetings these two went the full three sets with the matches being decided by a handful of points. This would turn out the same way. Venus would come within two points of the win after taking the first set 7-5 and, leading 5-4 in the second, getting to 15-30 on Kvitova's serve. Kvitova stepped up and fired down two big serves and eventually held and took the tiebreaker to force a third set. In the final frame the women exchanged eleven holds of serve. Finally, serving at 5-6, Venus got loose. She played a few poor backhands and that was all it took. Kvitova broke to win the match and did not lose a set for the rest of the tournament, en route to her dominant Wimbledon win. For Venus, the match would serve as a resounding statement on the state of her career. Since her diagnosis with Sjogren's Syndrome in 2011, she has had to battle both her body and opponents to stay competitive relevant. After Wimbledon, 2014 turned out to be a massive year for Venus. She won the Dubai Championships, beat her sister Serena in Montreal and would make a total of four finals to finish in the top 20. When Serena plays her best tennis the matches are rarely compelling. She dominates, her opponents capitulate and the whole thing is over in short order. 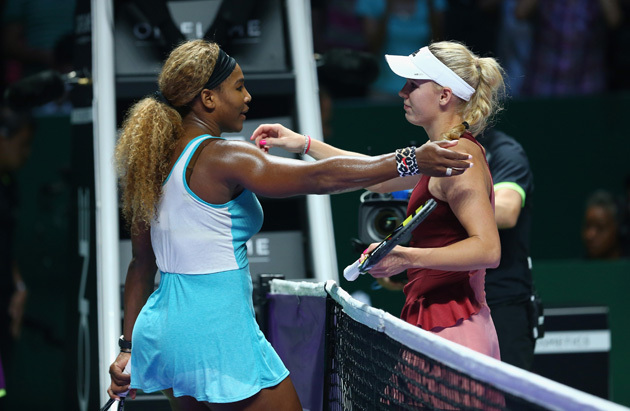 Wozniacki is well aware of this pattern, as she was barely able to make it past the one-hour mark in September when the two contested the U.S. Open final, which Serena won handily 6-3, 6-3. But Wozniacki felt due for a breakthrough. She had found her game again in Singapore and had pushed Serena to three sets twice over the summer, including a 4-6, 7-5, 7-5 loss at the Rogers Cup, which was also one of the best matches of the year. The script for that steamy weekend in Singapore looked pre-written. The Dane, having gone undefeated through group play, had a chance to cap off her resurrection with a win over Serena and potentially taking home the title. Early on it seemed as though Serena was ready to buy into the narrative. She played terribly to start the match and lost her cool quickly, just 25 minutes into the match. Down 2-5, she unleashed a massive racket smash in frustration -- the first sign of her desire to fight -- and battled back to take the second set and force a third. At 4-4 in the final frame, Serena blinked. She double-faulted to go down 0-30 and Wozniacki broke her to earn a chance to serve out the match at 5-4. "I felt like I played so well," Wozniacki said. "But when you play Serena, even when you play your best tennis, sometimes that's not enough." If Maria Sharapova is going to throw some epic shade, the match is probably going to end up on our year-end list. The quality was at its highest at the end of the match, but this nighttime encounter had fireworks and intrigue throughout. Sharapova had won eight of the their previous 11 matches but it was Ivanovic who looked in complete control, building a 6-2, 5-2 lead behind some clean hitting off both wings. But Sharapova wasn't going to go down without a fight. She battled back to win the next five games. That's when the drama started. Ivanovic pulled up in the second game of the match and called for the trainer. After the match she said her stomach hadn't been feeling well all day and she felt nauseous and dizzy. But after getting her blood pressure checked and getting a few pills from the trainer, Ivanovic bounced back to play some of her best tennis of the night. She showed no signs of injury or illness and Sharapova took exception. Serving at 4-3 to consolidate a break, Sharapova was broken thanks to some exquisite play from Ivanovic and a double-fault off her own racket on break point. "Check her blood pressure!" Sharapova yelled sarcastically at the chair umpire. Despite the frustration, Sharapoava would eventually get a chance to serve for the match at 5-4 and held two match points. Ivanovic saved one with an incredibly gutsy forehand down the line winner and Sharapova couldn't convert her second. 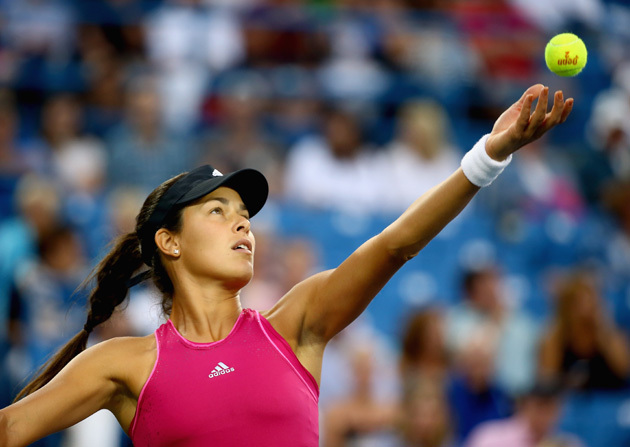 Ivanovic would go on to hold her serve and then break to win the match after two hours and 46 minutes. We all had to check our blood pressure after this one. ​Kvitova and Kerber put a coda on the 2014 season with this three-set thriller that caused a hazardous amount of rollercoaster whiplash. The 13,000 fans at the O2 Arena in Prague had no way of knowing how this three-hour epic was going to pan out. The first set lasted 76 minutes after Kvitova fought back from 2-5 down only for Kerber to finally overcome her nerves to take the first set in the tiebreaker. The second set went the other way, with Kvitova leading 3-0 before Kerber stormed back to win six of the next seven games to force a third set. The final set went the way of the first. Kerber again built a seemingly insurmountable lead at 4-1 before Kvitova played her best tennis of the day to win the next five games and secure the Fed Cup title for the Czechs. The tennis wasn't always great. It was nervy and scratchy at times, with both women fighting themselves. But it was incredibly compelling theater. Agnieszka Radwanska d. Victoria Azarenka 6-1, 5-7, 6-0, Australian Open quarterfinals. There are times when you laud a performance more than the match itself. After all, just because your opponent couldn't match your level doesn't mean that your own performance should be forgotten. That was the case for Radwanska's scintillating performance to beat defending champion Azarenka, a surprising result given she had lost their last seven matches. Azarenka played some beautiful tennis in the second set but the Pole was too good that day. Petra Kvitova d. Eugenie Bouchard, 6-3, 6-0, Wimbledon final. Kvitova's win also falls in the "best performance" category. This was just a clinic in shot-making and an incredibly fun watch. Caroline Wozniacki d. Maria Sharapova 6-4, 2-6, 6-2, U.S. Open fourth round. Venus Williams d. Serena Williams 6-7 (2), 6-2, 6-3, Rogers Cup semifinal. 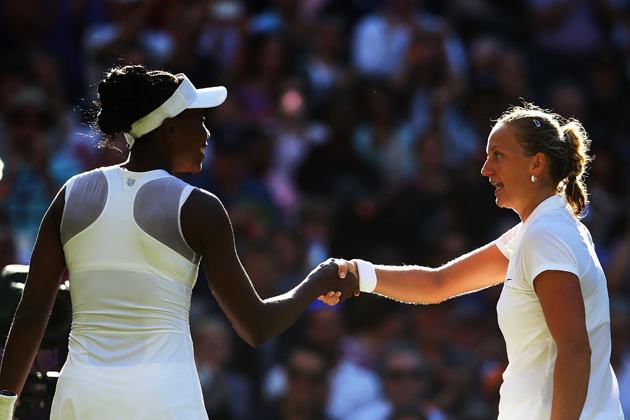 It was the best match the sisters had played against each other in years, with Venus snapping a five-year losing streak to her little sister. Serena wasn't at her best, but this was great quality between two legends of the game. And if this is the last time we ever see these two battle it out, it was a good way to go. Venus Williams d. Angelique Kerber 6-3, 3-6, 6-4, Rogers Cup third round. The first game lasted 12 minutes. At one point Venus won five straight games. Then Kerber went on a string of winning six of seven games. The rallies and momentum swings in this match were incredible. Here's the final set. If you're short on time, fast forward to the final game.